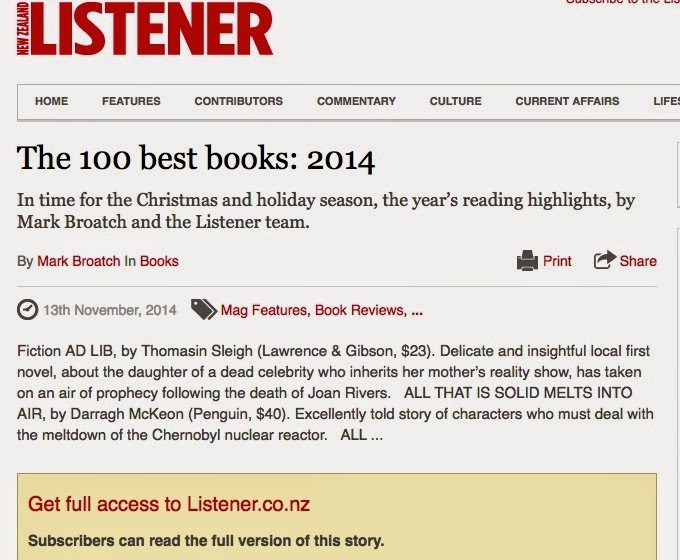 Thomasin Sleigh's debut novel Ad Lib has been featured in the NZ Listener's Top 100 books of the past year. Hers is one of four novels written by a New Zealander to be on the list. We were proud before and we're proud still. And what's more, it's the only title to be outside the impenetrable (well, penetrable for $5) paywall of Bauer Media. Here's what you see for free. That can go along with the wonderful April review from Sam Finnemore. Bravo! Buy it here! (note: we've just sold out, but expect a new run to be in by mid-December).